The Global Educator: This is what I mean by 'Ubiquitous'! My 14-year old daughter wants to learn a musical instrument...well, she has learnt the violin, the piano and is currently taking singing lessons, but is wanting further immersion in music. My influence as a jazz musician is strong, and she enjoys listening to all my jazz CDs (or should I say MP3 files these days?). We are about to take off from Qatar for the summer, as an an incentive to do something useful over the summer, rather than not, we have borrowed the Qatar Academy Yamaha alto saxophone to take with us to see if she will 'take to it', become inspired, motivated and enthralled enough for me to go and buy one for her. 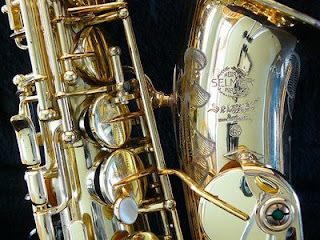 So, in our possession is one shiny, loud, amazing alto sax! Will we get it safely on and off all of the plane trips we are taking this holiday? What has been interesting is the approach to learning that has taken place with this instrument, and therefore the title to this blog post. Getting the saxophone home my daughter assembled it and then started to blow...and got a good sound almost straight away! But, we did not know what else to do, where should the fingers go? How should the mouthpiece be placed inside the mouth etc?? So, on the couch together, Violet with the sax, me with the MacBook online via our Wireless network we looked up tutorials on the Internet. Very quickly we found videos that showed the basics of getting started, we knew where the fingers go, we heard others playing the also saxophone. There is no need to wait to go and buy a 'book' or a 'video/DVD', these resources are available for all...and in the comfort of the couch! Later, still honking away, Violet comes to show me the recordings she made of her playing using her mobile phone. 'Listen Mum, this one sounds OK, ....but I like this one better...listen to the notes I am playing'. How absolutely amazing! A beginner musician, mobile computing, the ubiquity of learning with tools that are just there ready to be used. With online access and mobile devices learning is fully supported and engagement is high...why wait? ?